Join us for a dynamic discussion with keynote speaker, Steven J. Durning, MD, PhD, FACP, who is internationally known for his research and teaching on clinical reasoning in medical education. The complexities and challenges inherent in the teaching and learning of clinical reasoning are encountered by all physical therapist educators, whether working with students in classroom and clinical settings or with residents and fellows in post-professional programs. The symposium is designed for all educators across academic and clinical environments (DCEs, CCCEs, CIs, Residency/Fellowship Directors/Mentors, Academic Faculty) working to facilitate learners' development of clinical reasoning abilities. 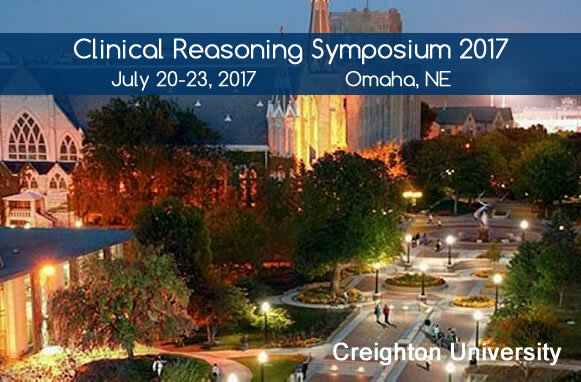 Participation in the symposium advances our understanding of clinical reasoning teaching, learning and scholarship across academic, clinical, and/or residency/fellowship settings. Educators from various settings will learn and work together to share and collaborate on successful assessment, teaching/facilitation and remediation approaches for students, residents and fellows. Steven Durning,MD, PhD, FACP, Professor of Medicine and Pathology at the Uniformed Services University and well known researcher exploring clinical reasoning, will be the keynote speaker at the symposium. Dr. Durning serves as the Deputy Editor for Academic Medicine and is a co-author of a recent book in the teaching medicine series, Teaching Clinical Reasoning. Utilize clinical reasoning teaching concepts from medical residency education to develop strategies for PT academic and clinical experiences and residency/fellowship clinical training. Utilize current rubrics/tools to assess clinical reasoning, communicate deficits, and monitor progress across academic and clinical settings. Compare and contrast commonalities and differences in learning characteristics from PT professional students to residents/fellows and build remediation strategies for the challenging learner and advanced learner. Analyze common pitfalls of mentoring and discuss self-reflection strategies as a mentor. Build collaboration between educators across the continuum of PT clinical education to redesign/construct new training models for facilitating and remediating clinical reasoning. Formulate a professional development plan for enhancing clinical reasoning within one's academic/clinical practice setting. Center Coordinators of Clinical Education (CCCE), Directors of Clinical Education (DCE), Residency and Fellowship Directors and Mentors, Clinical Instructors (CI) and Clinical and Academic Faculty. Priority enrollment is provided to participants who are part of the intended audience and are members of the Academy of Physical Therapy Education, APTA. Maximum enrollment is 75 participants. Please do not make travel arrangements until you receive confirmation of registration. Prior experience with mentoring/teaching in a clinical setting (entry level, residency or fellowship), or in an academic setting is highly desired. Minimum of 2-5 years of clinical or academic teaching is preferred. The workshop is designed to be interactive with panel discussions, and large and small group interaction. 1:1 Professional development meetings are held with participants to discuss professional goal(s) and facilitating clinical reasoning, teaching, mentoring and scholarship within each learner's practice setting(s). Sign-ups for professional development meetings will occur on site. Registration is Now Closed! Thank you. The APTA Academy of Physical Therapy Education thanks the following sponsors of this event.